The USAID Mission in DR Congo has partnered with IITA to promote research in forestalling Cassava Brown Streak Disease (CBSD), which has drastically reduced cassava production in the country since the late 1990s and early 2000s. 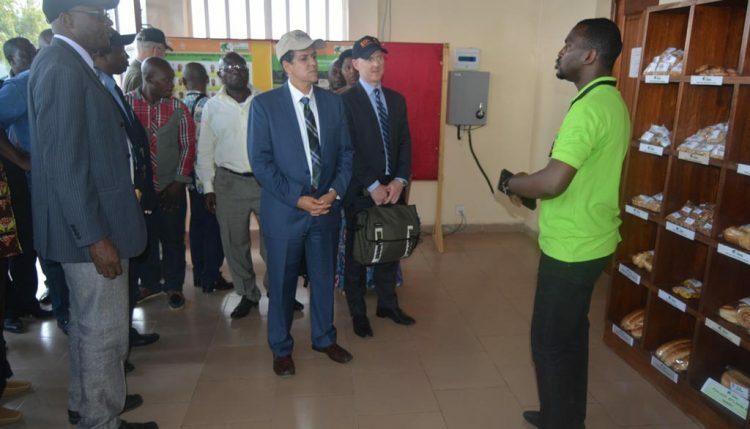 Christopher Tocco (center) with other USAID delegates and event participants at the youth Agripreneurs exhibition center. The collaboration will be implemented through a USAID-funded CBSD project in South Kivu, which was officially flagged off on 22 June by Christophe Tocco, USAID Mission Director, DR Congo in the presence of Adolphine Mulley, the Provincial Minister of Agriculture, Rural Development and Environment; Muller Ruhumbika, Provincial Minister of Plan; representatives of various government agencies; and IITA scientists and staff. According to Tocco, USAID has had many effective partnerships with IITA and is banking on its expertise to improve the livelihoods of smallholder farmers in sub-Saharan Africa. “USAID has a mission to help developing countries move towards sustainable development. We are working with stakeholders like IITA to achieve enduring impacts because CBSD, now prevalent in Eastern DR Congo, may spread countrywide if nothing is done to stop the virus,” Tocco added. Presenting on the highlights of the CBSD project, IITA Country Representative Nzola Mahungu, said that DR Congo was the number one producer of cassava in Africa before 1990. However, the country’s production nosedived from 20 to 15 million tons per year between 1990 and 2000 due to severe cassava mosaic disease attack. Presently, CBSD, another major cassava disease, is causing serious havoc in some cassava-producing provinces of the country. “I believe that with this new project, the CBSD menace will be reduced,” Mahungu said. Chris Okafor, Officer-in-Charge of the Bukavu Station, presented an overview of the Station’s work as well as highlights of ongoing projects. 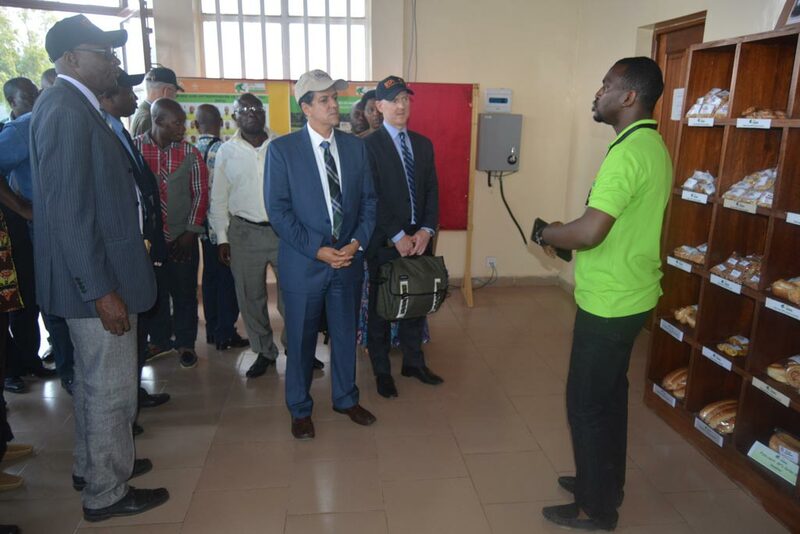 He especially drew the visitors’ attention to the IITA Youth Agripreneur initiative and its progress to date. He invited the visitors to find time to visit the Station’s state-of-the-art science laboratories and the crop processing facilities run by the youth group. He had also invited the visitors to join IITA in celebrating its Golden Jubilee on 29 June at College Alfajiri in Bukavu town. On behalf of the South Kivu Government, Mulley thanked the Mission Director for visiting the Province. She said that cassava was the main pillar of food security for 80% of the Congolese population and is also a major cash crop. She urged all the actors to participate actively in the project and ensure its successful implementation.